It’s heartbreaking and unfathomable to imagine anyone abandoning an animal to starve to death. 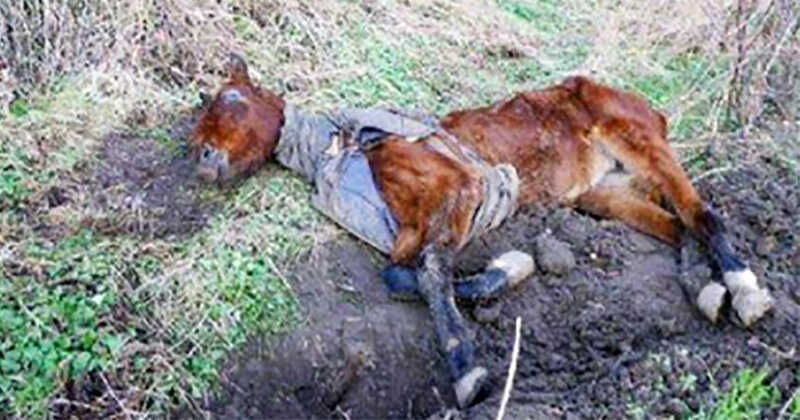 In this case it wasnt just one animal but three — three horses left to starve to death in a field in Buckinghamshire, England. The Royal Society of Prevention of Cruelty to Animals found them and determined they were in such a bad way, it was unlikely that any of them would survive. But one plucky pony held on strong and after love, care and attention her transformation is incredible. See for yourself in the pictures below. Sadly two of the horses rescuers found didn’t make it but Polly the then-5-year-old bay mare held on. Polly was starving to death and weighed just 696 pounds, which was half her normal weight. Her ribs were sticking out and she had zero body fat. Her rescuers said she was the thinnest living horse they had ever seen, and it was feared any treatment could kill her. Jeanette Allen, chief executive of the Horse Trust, said: “It’s a miracle Polly is still alive. It’s the worst case of horse neglect I’ve ever seen,” according to The Daily Mail. The animal lovers that nursed her back to life couldn’t even feed her too much to start with as too many calories could shock her body and cause it to shut down. “When we first started treatment it could have proved toxic for her. It was a horrible Catch 22 situation where we had to treat her worms to stop them killing her but the treatment itself could have caused fatal damage,” said Jeanette. Despite the odds staff never gave up on sweet Polly and this sweet horse started to recover. After just six months Polly went from 696 pounds to over 1,000 pounds and finally had the strength to gallop around. “She’s a real mare now, the transformation is unbelievable,” Jeanette said. Polly now runs around the field with other rescue horses, something she was far too weak to do at the beginning of her rehabilitation. “She’s got a group of male horses who follow her everywhere—it’s a right little fan club,” said Jeanette. She is still receiving treatment but now she can enjoy life with the love and nurturing she deserves. Her rescuers should be so proud of themselves for achieving such a miracle. And Polly is clearly a wonder horse! Please share this beautiful story with all your animal-loving friends and help bring a smile to their faces today.